Calling all businesses and foundations! Senior Pets Need YOU to make Silver Paws 2017 the best event of the year! 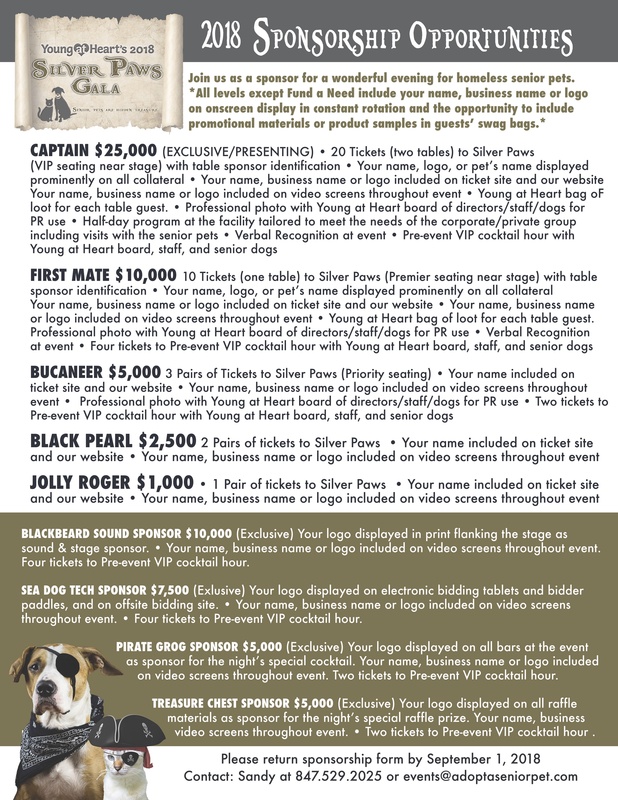 By sponsoring Silver Paws, you allow 100% of the funds raised the night of the event to be applied to Young at Heart's mission of rescuing and rehoming senior pets, and you get Rockstar status by supporting animals in your community in such a fun and important way! The following sponsorships are available. Please contact Sandy at events@adoptaseniorpet.com or call us at 847.520.2025 with any questions. Thanks for giving homeless senior pets a chance to enjoy their golden years! CLICK HERE to download the complete sponsorship packet including a printable sponsorship form! Already know you'd like to help senior pets by sponsoring Silver Paws? You can fill out the online form and pay online! CLICK HERE to complete the online sponsorship form or click the pawprint!